Three challenges are holding back school districts from reaching broadband goals. Over the past two years, school districts have brought high-speed broadband connections to 20 million more students, edging closer to a national goal that's been beset by challenges. The 2015 State of the States Report, released in November by the San Francisco–based nonprofit EducationSuperHighway, sheds light on the state of school districts across the country that are in pursuit of high-speed Internet connections. In 2013, only 30 percent of school districts were reaching the Federal Communication Commission's minimum Internet access goal of 100Kbps per student. This year, that number is at 77 percent, according to the report. That leaves 21 million students without school access to speedy, reliable broadband, a deficit that limits a curriculum’s reach. School districts are hampered by three challenges: access to fiber, affordability of broadband connections and insufficiency of school budgets. 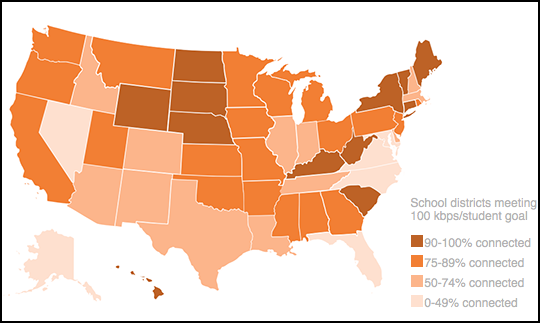 While some of these challenges relate to the size of a district, with rural districts having particular trouble obtaining reliable and affordable fiber-optic connections, a map of the states provided by EducationSuperHighway shows that many problems are nationwide. But even the most well-connected states face some serious challenges with affordability. Out of all 50 states, only New York’s and Michigan’s school districts met more than 50 percent of EducationSuperHighway’s target price of $3 per Mbps. The report also includes a warning to school districts upgrading only to the minimum standard, because the appetite for bandwidth, once laid, continues to increase. "[Ninety-one percent] of school districts will need to significantly grow the amount of broadband they purchase; the typical school district will need to triple its bandwidth in the next three years," according to the report's summary. The organization's CEO, Evan Marwell, told EdTech that the number can increase by up to 100 percent year over year once broadband reaches a certain threshold and digital learning truly begins. "When schools implement digital learning, their demand for broadband capacity goes up — through the roof," says Marwell. "A school that installs 100mbps broadband will need to update that the following year to 200mbps in order to meet the students' and teachers' needs." Marwell and his team have been working with states to facilitate connected classrooms — a process that has been made easier through reforms formalized by the Federal Communications Commission in 2014. The key to overcoming hurdles to classroom connectivity often boils down to strong leadership at the state level, Marwell says. The 2015 State of the States report lists 38 governors committed to helping students get the connectivity they need for a modern education. View the complete report to see how governors and states stack up.